Nursing students entering professional practice find it difficult to transfer learning into clinical practice. Including simulations in a nursing curriculum provides students an interactive, practice-based instructional strategy and offers nurse educators the opportunity to meet students’ educational needs. Our Learning Resource Center (LRC) houses the Simulation Lab, Clinical Learning Lab (CLL), and two graduate labs. The LRC is located on the third floor of the SON, and easily accessible to students. The Learning Resource Center houses essential equipment and tools that students use both for practice and skills assessment. Students are introduced to the best practices in patient safety and quality of care and can critically think, solve problems, and care for diverse clients in a safe, nonthreatening environment where mistakes can be made without risk to patients. Through the use of patient simulator manikins and other high-fidelity simulation approaches, these interactively challenging experiences support nursing professionals in developing and practicing team and decision-making skills. The Simulation Suite has two hospital-like rooms and an observation/control room used for simulated scenarios for student learning. In the Simulation Lab, nursing students interact with state-of-the- art mannequins that simulate symptoms and conditions specific to real-life patients and scenarios. 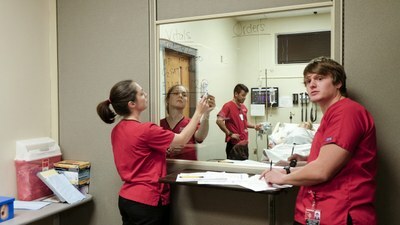 The Simulation Lab contains 3 high-fidelity manikins, as well as a newborn manikin. These manikins give a human-like realism to the simulation experience. As students progress through their coursework and prepare for clinical placements, they spend more time in the simulation center, learning hands-on patient care ranging from basic skills to complications during childbirth. Simulations offer challenging but safe opportunities to review and assess the effectiveness of our students' developing skills, diagnostic instincts, and efficiency through hands-on learning.